Born in Arlington, VA, and a 1999 graduate of Herndon High School, Gunnery Sergeant Ryan Jeschke enlisted in the Marine Corps in July 1999. GySgt. Jeschke came into the Corps as a Basic Reconnaissance Marine, serving with 1st Recon Battalion, spent time as a reservist, and joined 1st Special Missions Training Branch, Camp Pendleton, before it became part of the Marine Special Operations School in 2007. He was an exceptional wrestler and martial artist, earning a 1st degree Black Belt in the Marine Corps Martial Arts Program. GySgt. Jeschke deployed in support of both Operations Iraqi Freedom and Enduring Freedom. In the early morning hours of Aug. 10 at the Village Stability Platform in Puzeh, following a meeting with local Afghan officials, a rogue local Afghan dressed in a police uniform opened fire on the team’s leadership killing GySgt. Jeschke, his Team Leader and their EOD technician. GySgt. 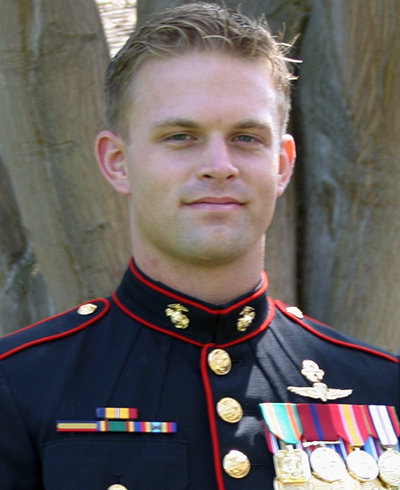 Jeschke’s personal decorations include Bronze Star with combat V awarded posthumously, two Purple Hearts (second Purple Heart awarded posthumously), four Navy-Marine Corps Achievement Medals (one with combat V), two Combat Action Ribbons and four Good Conduct Medals.